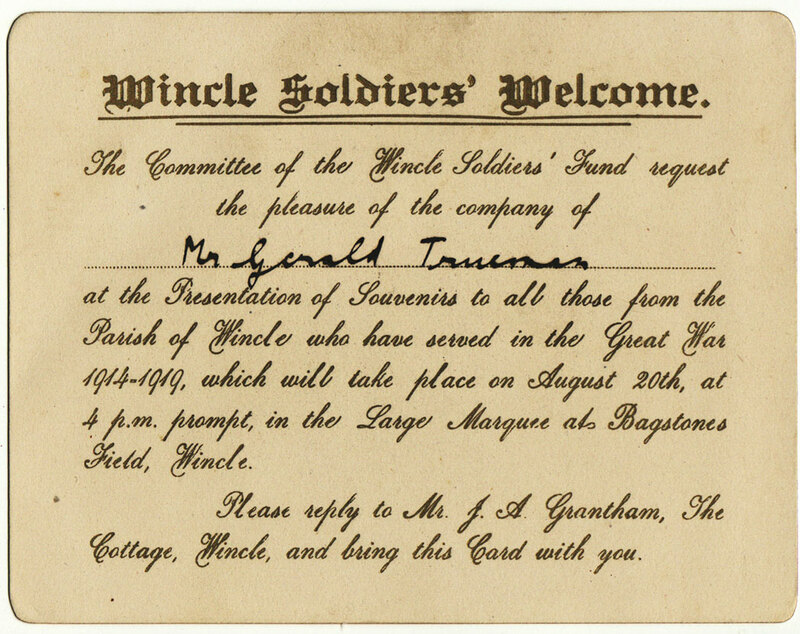 Gerald was the youngest son of John and Martha Jane Trueman (nee Warrington). He was born at Higher Hardings Farm, Higher Sutton, on 14 Feb.1895. He grew up with his elder brother Harold and his two older sisters Edith and Sara Elizabeth (Bessie), eventually moving to Sandyway Farm, Clulow Cross, in Wincle where his two younger sisters Doris and Phyllis were born. Many members of Gerald’s immediate family lived and farmed in the Sutton area whilst othes lived not far away in Gawsworth, Over Alderley and Rainow. Gerald attended Wincle School and then helped on various family owned farms. 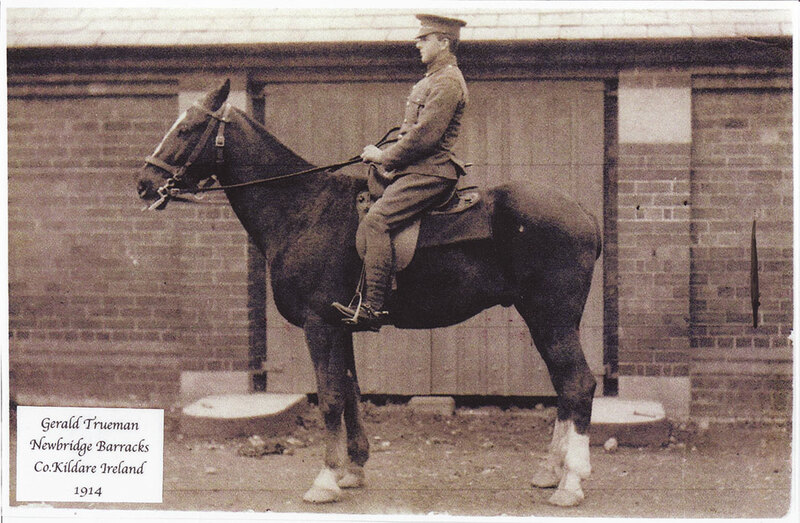 He volunteered very early on in the war, on 29 August 1914, at the age of 19 years and precisely 199 days. He was posted to Newbridge Barracks in County Kildare, Ireland, where he was placed into the Royal Field Artillery (RFA) and he became a groom caring for officers’ horses, despite being officially a driver. Gerald left England from Devonport on 7 July 1915 and travelled with the army through Rouen, France on his way to Alexandria in Egypt. From a later letter home it seems he spent some time in the Dardanelles/Gallipoli. Then in February 1916 he was sent from Egypt to Mesopotamia (Iraq) where he spent most of the next two years and eight months. He was allocated to A/55 Brigade RFA but also seconded to other RFA Batteries as and when required and he a spent a short time in India. According to his letter the first six month in Mesopotamia were pretty terrible, not because of the fighting but because so many men were ill with a lot dying from cholera. Fortunately things eventually improved and Gerald was very impressed by his commanding officer who, although he worked them very hard, took good care of his men and as a result they suffered fewer casualties than other units when the fighting did begin. He was wounded in action on 11 April 1917, suffering a fractured wrist. He remained on duty initially but was then hospitalised a few days later for six weeks and didn’t re-join his unit till July. On his return home to Sandyway Farm in 1918 Gerald was not in good health and was nursed back to health by his parents and sisters. A while later met a young lady from Shincliffe Co. Durham who was in service locally with his sister Doris. Her name was Lily Spedding, a butcher’s daughter. They eventually married on 6 January 1926 in Shincliffe and took over the tenancy of Barley Fields Farm, Higher Sutton, eventually purchasing the property. Gerald and Lily expanded the dairy business delivering milk throughout Sutton and a greater part of Macclesfield with two milk floats and later with two Austin vans. In later years they moved to The Dawsons in Ivy Road, Macclesfield purchased from the Bianchi family. It was a small holding, satisfying in a way Gerald’s love of the land where he could potter about in familiar surroundings. Eventually the Dawsons was subject to a compulsory purchase order from Macclesfield Borough Council to expand the Weston Estate, so Gerald and Lily bought Wood Brook in Siddington, where they spent the remainder of their lives; Gerald constantly saying it was 'too fancy for him. Gerald suffered a brain haemorrhage and died in West Park Hospital on 16 Jan. 1976, aged 81. His ashes are interred in the Garden of Remembrance at St. James’ Church, Sutton, with his wife Lily who passed away in December 1983. The majority of the Trueman family and their relatives are buried at St. James’ Church Sutton.